The fabulous Shiiine On Weekender returns 10th-13th November for another packed weekend of top quality music and shenanigans at Butlins Minehead. Shiiine promises to be a veritable feast of mainly 80’s & 90’s classic acts that shaped a generation - and at a first class location to boot. Never been to a Butlins Music Weekend before? Check out a typical Festivals For All BMW Review for just a flavour of how good these things are! Forget themed weekends and silly-string - Shiiine is a seriously good indoor music festival hosted by Butlins – plenty of the artists on show over the weekend still sell out auditoria around the world and many pundits would argue are as relevant to today’s music landscape as when they first hit the scene. It’s a pretty eclectic mix covering everything from indie-pop and alt-rock to pysdub and folk-rock. Aficionados of the immediate pre and post Madchester dance and indie era are in for an absolute delight. 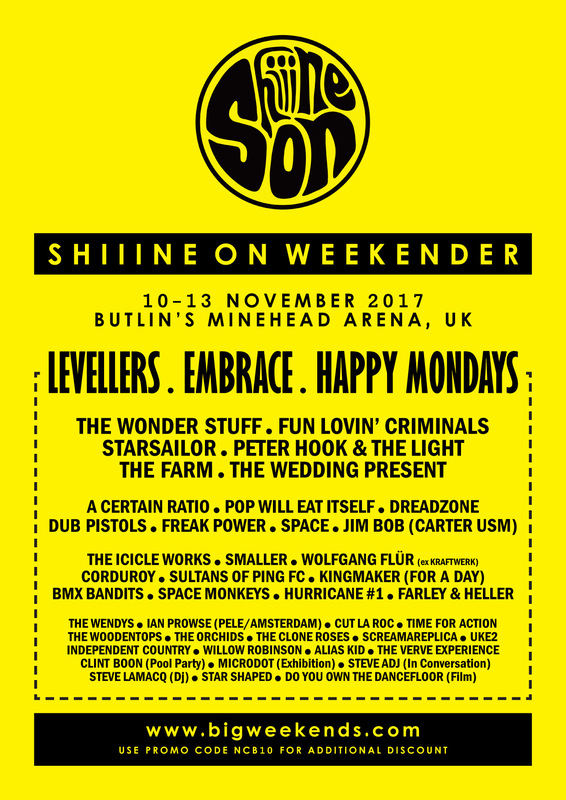 Over the weekend Shiiine offers up some of the most successful and influential acts of any generation with genre definers like Levellers, Dreadzone, Fun Lovin’ Criminals and The Wedding Present alongside other stadium filling legends like Happy Mondays, Wonder Stuff, and Peter Hook & The Light. Throw around 40 acts into the mix plus some immense club nights and pool parties with DJ sets from Steve Lamacq and Clint Boon amongst many others and Shiiine should be a absolute stormer! Now listen up – Butlins reinvented themselves years ago as contemporary holiday destinations and are ace locations for weekend music bashes! Festivals For All is increasingly sold on the whole concept of ‘holiday centre’ music weekends. If you’ve yet to experience a music weekend it’s a cracking time, offering the best of a festival, a concert, and yes, cabaret - all rolled into one. They provide an out of season festival fix without the mud – and your own ‘private facilities’ too! The holiday resorts are excellent; this is truly a 21st century experience and FFA found Butlins holiday resorts a wonderful base to enjoy some splendid music alongside the wealth of other entertainment and dining options Butlins have to offer. With damned fine large auditoria and a few thousand happy bunnies bouncing around, Shiiine promises to be a very special weekend indeed. The resort offers a wealth of accommodation and dining options for the weekend – check out the latest availability HERE.